China Carrier Preps for Flight Ops? 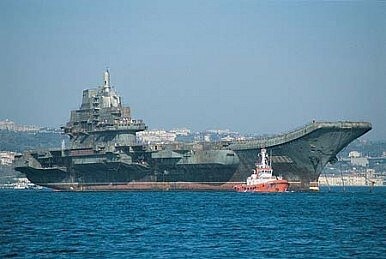 New images surfacing on the internet suggest China’s aircraft carrier has taken a big step toward flights ops. Photos posted to the Internet in China last week seem to confirm that the Chinese Navy has installed arrestor gear and other vital equipment on its refurbished Soviet-made aircraft carrier, the ex-Varyag. If genuine, the installations could represent a big step forward for the first-ever seaborne, fixed-wing aviation capability for the People's Liberation Army Navy. One image appears to show a traditional four-wire arrangement on the aft flight deck of the roughly 1,000-foot-long carrier. Another depicts a small tractor of the type used to move aircraft around the deck. The ex-Varyag, which was speculated to have been renamed the Shi Lang in Chinese service, underwent more than a decade of rework in Dalian shipyard following her acquisition from Russia in the late 1990s. She conducted her first sea trial in July and performed a second, brief, at-sea test in November. These tests didn't include fixed-wing aircraft. Indeed, much of the equipment necessary to support airplanes apparently had apparently not been installed. In December, a Chinese government spokesman denied rumors that Russia had refused to sell China arresting gear. The ex-Varyag's deck equipment was being developed indigenously, the spokesman said. The wires and the tractor should allow the ex-Varyag to begin flight trials with navalized J-15 fighters as early as this spring – assuming, of course, that other requisite gear has also been installed, including air-traffic-control radars, communications, aircraft fueling and repair facilities. Even with all that equipment in place, it could take years for China to train aviators and deck crew to safely and efficiently launch, recover and maintain carrier-based aircraft. Coordinating ship and plane tactics could require additional years of trial and error. A truly effective carrier capability is one of the Holy Grails of modern naval operations. China's progress toward that goal has been slow but steady. China's Realizes Carrier DreamPutting Eyes on China's CarrierThe Arctic Sea—a New Wild West?China, Russia to Hold Largest-Ever Naval DrillsLiaoning – Paper Tiger or Growing Cub?